Will this new ecological and family-friendly holiday parc herald a new era in sustainable tourism? Perhaps it has a lot to do with the community-based political structure in France, but French have always striven to keep their tourism industry sustainable since long before it became a buzz-word label coveted by multi-national behemoths. It’s appropriate, therefore, that a new type of holiday parc will be coming on-stream later this summer that is billed as breaking new ground in sustainability for the model. 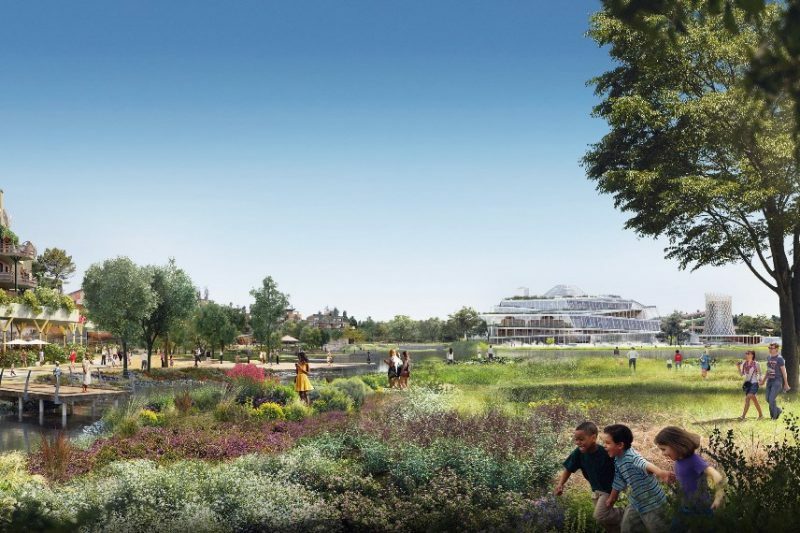 Villages Nature® Paris is located 32km from the City of Light and is a joint venture between Euro Disney S.C.A and the Pierre & Vacances Group, both of whom will be well known to Irish readers. It is billed as a destination that is reinventing the concept of holidays. Comprising five immersive worlds, this unique holiday village will make guests feel at one with nature and offers a complete change of scene to help them reconnect with the things that truly matter, whether they visit on their own or with their loved ones. Opening on 11 August 2017, the brand-new holiday village embraces sustainable tourism as a core value that is at the forefront of all projects, and employs all the latest ‘best practice methods’ to minimise its ecological footprint. Boasting an impressive total surface area of 9000m2, the Aqualagon® is the biggest water park in Europe to be heated entirely with geothermal energy and offers a whirlpool of water-based activities for all. Why not start by whizzing down one of the six huge Aqualagon® slides? And after taking the plunge, the aquatic climbing wall is waiting to be tackled. With wave pools, white-water rivers, geysers, bubbles and splash pools; this water park promises aquatic fun for all, right down to baby swimmers. Plus, for guests who prefer to unwind and indulge in slower-paced activities, the Aqualagon® is fully-equipped for moments of relaxation. They can sit back in the hot tubs, recharge their batteries in the spa and swim in the outdoor lagoon, which is heated to 30°C throughout the year thanks to the geothermic energy. BelleVie is a working farm where, instead of just observing the animals, guests can participate in daily workshops and relish the simple pleasures of life on the farm. Visitors will learn how to look after the farm animals, and parents can treat their children to a ride through the surrounding forest at the Pony Club. BelleVie Farm is also home to a full-scale farm playground where budding little farmers will enjoy playing on the silo slides, hay bale trampolines and tractor bikes. Celebrating the food produced at the farm, guests can take part in cooking lessons in which they will learn to make their own bread and butter. They can also take a pit stop at the farm’s tea room, which is open all day, and take back some treats from the farm shop: the perfect presents for friends and family back home. Colours, textures, flavours and aromas, the Extraordinary Gardens are a feast for the senses comprising four gardens that represent the four Greek elements – water, fire, earth and air – and are designed to flower in every season. Wandering through each garden, guests can admire the expanse and exquisite detail of the lush surroundings and revel in the spectacular evening events that will be hosted there from August. Keen green fingers will be pleased to hear that the Extraordinary Gardens’ ‘Artisans’ will be on hand to give them top tips on how to care for their own garden at home. In the heart of the enchanted forest lies a playground that will delight both little ones and ‘big kids’. With hiding places and hanging nests, Mother Nature provides the perfect setting for games of make-believe. Whether they’re building dens and tree houses, hurtling down suspended rope bridges or exploring mysterious trails, children can let their imaginations run wild in this enchanted place. A selection of workshops, puzzles and interactive shows will add to this creative land of magical mystery. The Lakeside Promenade is the true heart and soul of Villages Nature® Paris. After a spot of shopping, guests can tuck into a hearty meal at one of the many restaurants and cafés that all serve delicious, locally-sourced produce. At the Village Square, a wonderful range of entertainment, sport and leisure activities, kids clubs and evening events is available for adults and children from bowling to bed-time stories. And what better way to spend a lazy, sunny afternoon than gently pootling about the lake on pedaloes and boats? Or even stretching out on the beach in front of BelleVie Farm? Those feeling a little more adventurous can try out stand-up paddle-boarding and challenge friends to a game of beach volleyball. The list of activities for families, friends and couples of all ages really is endless, so they can easily throw themselves into the Villages Nature® Paris way of life. Cocoon VIP is designed with wellbeing in mind, creating a haven of serenity. Soft and elegantly decorated, Cocoon VIP is available as a cottage or apartment by the lake or in the village centre. Prices start from 291€ for two nights for a cottage sleeping four people on a self-catering basis.